The other day, we just completed a hair transplant procedure with a child who has Congenital Temporal Alopecia (CTA). The day he was born, he had a bald patch on his head. It really weighed heavy on his mind and the thought of waiting until Christmas break (the time his parents had first planned to get it restored) was absolutely unbearable. The surgery was a success. We closely packed 470 follicular unit grafts onto the bald patch of his temple area. He’s really excited and anticipates the final growth of his hair grafts in the next several months. Congenital Temporal Alopecia is a hair loss condition which is present at birth and takes the form of a patchy hair loss on a child’s temple area of the head. The bald patch can be made up of very fine hair. It’s a non-scarring type of alopecia which, reportedly, responds rather positively to hair transplant surgery. Temporal triangular alopecia also known as TTA is a congenital hair loss condition in which the patient had a limited balding area on his temples. The condition is assumed to be congenital and is generally obvious since birth. 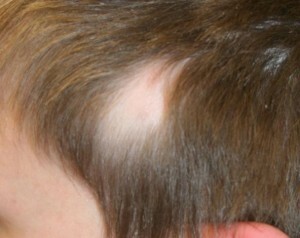 The balding spot may contain normal numbers of hairs, but they are all vellus and generally not visible. Congenital temporal triangular alopecia is considered a nonscarring alopecia and if biopsied should not be mistaken for Cicatricial alopecia. TTA respond well to hair transplantation and there are some studies that patient were treated with hair transplant surgery successfully with adequate coverage. The condition could be treated by a hair restoration surgery at any age. We at the California offices of US Hair Restoration offer treatments for congenital temporal trangular alopecia.